Not Bad Boys! Not Bad At All! 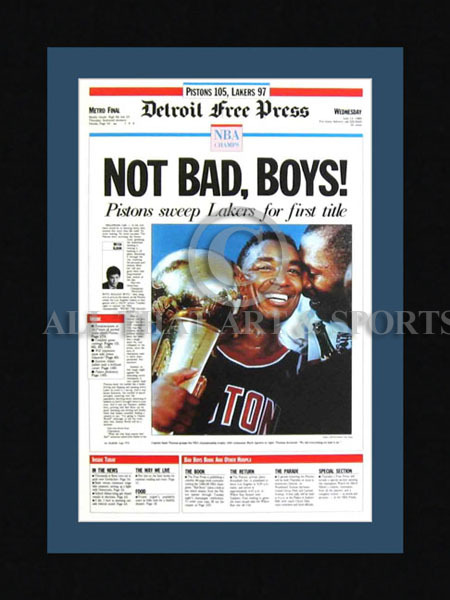 Last night, on ESPN, the latest episode of their 30 on 30 series was all about my favorite NBA team of all time … the Bad Boys of Detroit! Now, I’ve followed basketball for a long time … granted I’ve been following Michigan basketball more so the last decade or so, but I’ve always kept an eye on the NBA because of my memories of the Bad Boys. I remember watching the NBA Superstars VHS tape that came along with my Sports Illustrated subscription … and I would watch Isiah Thomas’ video over and over and over and over again. To this day, whenever I hear The Right Stuff by Vanessa Williams … I get images of Zeke driving to the basket for an up and in. I even get images of the one time he dunked (off a rebound at that). I have fond memories of hanging out at a shared garage in the Candlewyck apartments, watching the NBA finals on a small TV with rabbit ears. I remember how we danced on the neighborhood basketball court at 11PM when the buzzer sounded and the ghosts of the Lakers were finally swept away! I remember how amazed and proud I was of Zeke in the NBA finals the year before, playing his heart out on a broken ankle, scoring from all over the place in Game 7 vs. those same Lakers. This was a team that played defense and meant it. This was a team that was a team … and they meant it to be that way. This was a team that didn’t give a damn what David Stern wanted for Michael, or Larry, or Magic … this was a team that played the game on their own terms. They made Stern change the rules because of the way they played. This was the team that got me to like basketball and got me to be proud of a city called Detroit (even if they didn’t play in downtown). So, with credit to Mitch Albom for summing up how I feel about the Detroit Pistons of the 80’s and early 90’s … Y’all did good, boys! Not Bad Boys! Not Bad At All!